Getting the right advice and treatment for site dewatering is an essential part of every developer’s environmental responsibilities. Australian Dewatering Systems (ADS) manages your complete construction site dewatering program, including ground well construction, baseline monitoring of surface and groundwater, construction phase water quality monitoring, and compliance reporting. Working in close conjunction with you, ADS ensures each project is fully examined to develop site specific dewatering management plans. Clients achieve peace of mind by engaging hassle-free environmental management in a practical and cost-effective manner. ADS assists clients to develop a management plan that clearly meets the requirements of regulators, while considering the site conditions and commercial objectives of the project. Prior to dewatering qualified environmental scientists conduct baseline surface and groundwater investigations before designing an appropriate sampling and analysis program. During the construction phase there are regular water quality updates and advice on preventative or corrective action supported by detailed compliance reports. These comprehensive reports include a summary of dewatering pump rates, interpretation of the monitoring data, a statement on compliance and potential environmental risks, and recommendations for improvement. Where required there is also liaison with stakeholders and regulators on the client’s behalf to ensure the dewatering program is completed to the satisfaction of all parties. Expertise: ADS offers a dewatering management package unmatched by other providers. ADS engages highly qualified and experienced specialist environmental scientists recognised by regulators for delivering comprehensive, achievable management plans with the benefit of on-going expert advice. Comprehensive: ADS can provide all pre-assessment and construction phase water management programs. In addition to equipment we can assist with the water treatment of acid sulphate soils and contaminated land. Call us today on 1300 949 607 or contact us via this website. 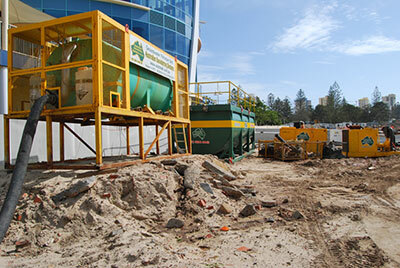 Australian Dewatering Systems pioneered the introduction of portable aerated settlement tanks as part of its dewatering program in use on sites throughout Australia. The tanks hold up to 26,000l of groundwater and can process up to 270l a minute. The settlement tanks set the benchmark for best environmental management practices. Using an aerator and baffle system the tanks progressively drop solids out of the discharged water resulting in cleaner water being passed into ADS’ patented dewatering filtration system. Cleaner water entering the filtration system requires a lower level of chemicals to treat to environmental requirements compared to water that is high in particulate matter. Use of fewer chemicals represents not only a cost saving but also massive benefits for the environment. Furthermore water treated using ADS’ industry-leading settlement tank system can be processed faster resulting in greater efficiencies and time savings. Australian Dewatering Systems patented groundwater filtration unit (foreground) with portable aerated settlement tank and pump units.